College Grad Outlook: Best Market In Post-Recession Era! | Challenger, Gray & Christmas, Inc. 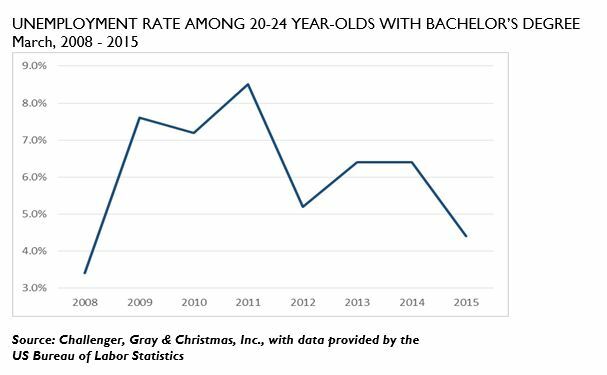 Rising demand for talent in finance, business administration, technology and health care have led to a significant decline in unemployment among recent grads over the last year. That decline is expected to continue for the more than 1.8 million college graduates entering the job market this year, according to the outlook. “In addition to an improving economy, we are beginning to see a rising number of retirements, which is creating more room for upward advancement, and, in turn, creating opportunities for entry-level candidates,” said John A. Challenger, chief executive officer of Challenger, Gray & Christmas. Indeed, over the last year, the unemployment rate among recent graduates is near pre-recession lows. As of March, the unemployment rate among 20- to 24-year-olds with bachelor’s degrees was 4.4 percent, down from 6.4 percent in 2014. The current rate is about half what it was at its peak of 8.5 percent in March 2011. “We are seeing a lot more churn in the labor market. It is estimated that roughly 10,000 baby boomers are retiring each day. Meanwhile, about 2.7 million Americans voluntarily quit their jobs each month. The vacancies left by these departures definitely help entry-level candidates,” said Challenger. A survey released this month by the Society for Human Resource Management reveals that more than one-third (35 percent) of organizations have already hired college students to begin working before or after their 2015 graduation. Of the 65 percent that have not yet hired soon-to-be college graduates, 71 percent plan to do so. Furthermore, a survey by the National Association of Colleges and Employers found that companies plan to increase hiring of college graduates by 10 percent over last year’s pace. The same survey indicates that demand is highest for graduates with degrees in engineering, business, and computer science.